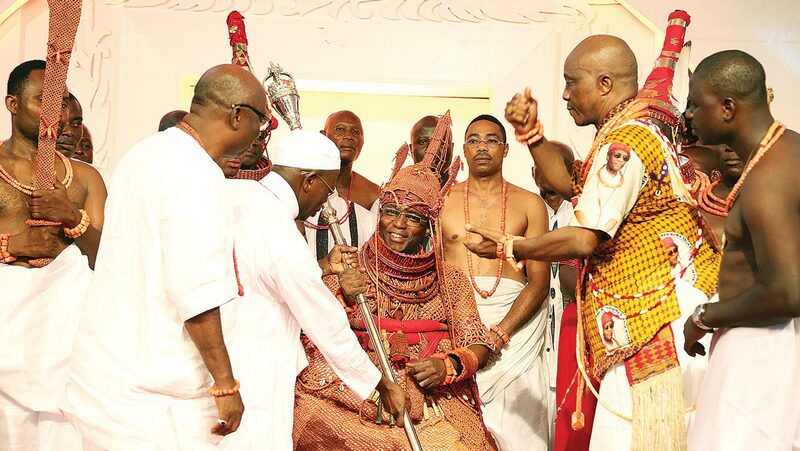 For hours yesterday, business activities in Benin, the Edo State capital stood still as the 40th monarch of the ancient city, Eheneden Erediauwa ascended the throne. Eminent Nigerians, including top government officials and traditional rulers, as well as members of the diplomatic community were in Benin to witness the coronation. The new monarch became the 40th in the kingdom beginning from the short reign of Orominyan as the first Oba after the end of the Ogiso Dynasty to the end of the last monarch, Oba Erediauwa. Eheneden chose the name Ewuare II, after Oba Ewuare The Great who ruled from 1440 to 1473. He is said to be the most revered, dynamic, innovative and successful monarch who transformed Benin politically, socially and religiously. He was reputed to have encouraged ivory carving. The colourful ceremony held at the traditional Urokpota Ground attracted dignitaries from all walks of life, including Vice President Yemi Osinbajo, Governor Adams Oshiomhole of Edo State, his successor-elect, Godwin Obaseki, governors of Osun, Oyo and Gombe states and the deputy governors of Edo and Imo states. The Minister of Information, Lai Mohammed, Minister of State for Petroleum, Dr. Ibe Kachikwu, his health counterpart, Osagie Ehanire and business mogul Aliko Dangote were also present. Among the royal fathers at the event were the Sultan of Sokoto, Emir of Kano, Emir of Zauzau, Etsu Nupe, Obi of Onitsha, Ooni of Ife, Olu of Warri, Orodje of Okpe Kingdom, Otaru of Auhci and Olugbo of Ugbo, Ondo State. The new Benin monarch said that irrespective of the different perspectives of history between Benin and Ile-Ife, they both agreed that Oduduwa, whom the Binis believe is a prince from their kingdom known as Ekhalderan, built so many kingdoms. His first son Oronmiyan was the first Oba of Benin after the Ogisos. “The long line of succession of kings in the kingdom known as Benin started in the 12th century by modern reckoning. There may be some different views about the origins of some of our ancestors but there is unanimity in the shared heritage between the people of Benin and Ile-Ife in identifying Oduduwa as the forebear of kingship in many kingdoms in parts of Africa called Nigeria today. “Historians all agree that Oduduwa sent his son Oronmiyan at the request of elders of Benin to return with them as ruler. Oromiyan’s stay in Benin may have been short but the before he left, a child was born to him who was later crowned Oba and he is known today as Eweka the first. He said in memory of his father, he established the Oba Erediauwa Annual Lecture Series with N10million to be invested in a trust fund to sponsor an annual well- researched topic in Benin history, public administration or Edo language.